Submitted by Mike Penn on 29 November 2018. I spent the day out on the Ross Ice Shelf yesterday! Click the Media tab for a link to a short video taken on the Ross Ice Shelf. Elina Valkonen (on my team - She is from Finland but is studying for her Ph.D. in Atmospheric and Oceanic Science at University of Colorado - Boulder) and I were lucky enough to get to go on a "Boondoggle." I'll tell you a lot more about Elina in a journal about all of the really interesting members of my team sometime soon! This isn't even my project...this is a BOONDOGGLE! "Boondoggle" is a term for working on a project that isn't your project. It is also used for a contract worker who is here as a cook or mechanic who rarely gets to leave one of the stations but gets to go lend a hand at a field camp. This specific project is officially called "Remote and Autonomous Measurements of Precipitation in Antarctica." 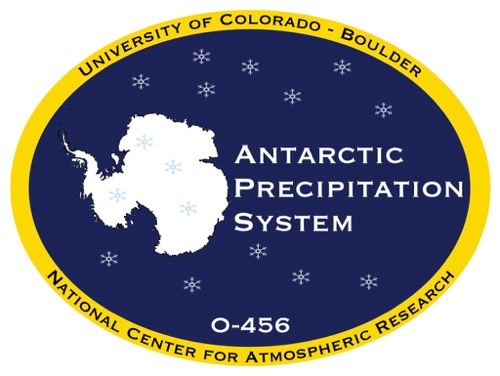 Automatic Precipitation System sticker (O-456) sticker It is led by Dr. Mark W. Seefeldt (who is the "Principal investigator" for the project and has a Ph.D. in Atmospheric Science ) and Scott Landolt (Associate Scientist and Co-Principal Investigator) who work out of the Cooperative Institute for Research in Environmental Sciences (CIRES), University of Colorado – Boulder. Also, Thomas Nylen, from UNAVCO (a non-profit university-governed consortium that facilitates geoscience research and education using Geodesy. Geodesy is also known as geodetics, it is the earth science of accurately measuring and understanding three of Earth's fundamental properties: its geometric shape, orientation in space, and gravitational field. How cool is that? So, basically, UNAVCO (Navigation Satellite Timing and Ranging Consortium) provides pooled support and expertise servicing geodetic equipment to National Science Foundation and N.A.S.A. funded projects. 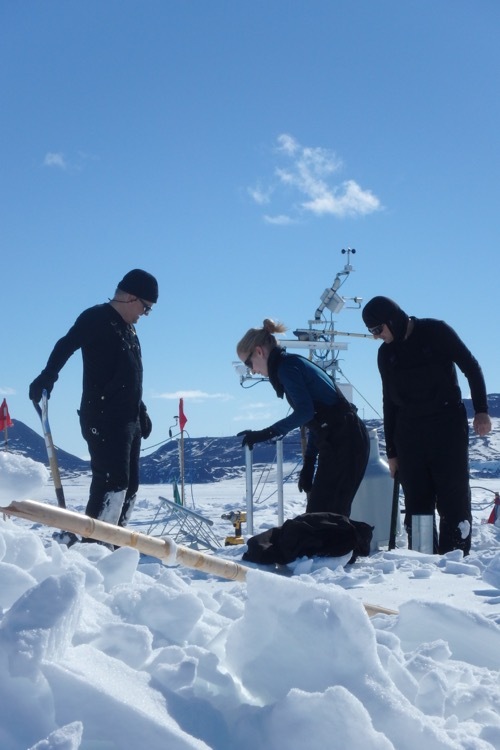 Dr. Mark Seefeldt, Scott Landolt and Elina Valkonen working on APS on Ross Ice Shelf. Why are you digging holes in the snow? 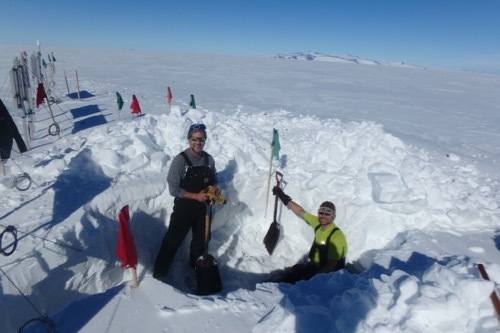 Digging out a battery box for a APS site on the Ross Ice Shelf, Mike Penn and Thomas Nylen working in the hole and with the batteries. We were installing a prototype device designed to differentiate the difference between blowing snow and new falling snow. Is this new snow or blowing snow? It is almost impossible to tell. 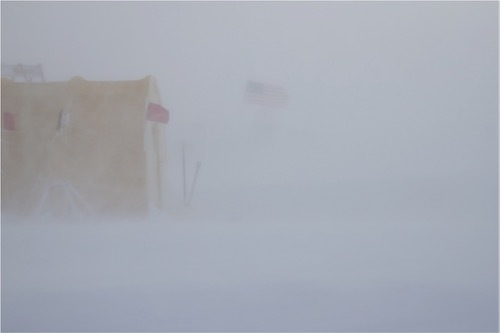 Photo credit Mark Seefeldt Precipitation is really difficult to accurately measure in Antarctica because of the very small amount of annual precipitation and the difficulty in distinguishing falling snow from blowing snow. We also worked also on the power system and data logger by digging up (about 4 feet down!) three battery boxes containing 22 batteries (each one weighs 70 lbs.) that are used to run their systems and communications. The snow is dense and heavy. When digging it breaks into large chunks. It can be cut with a snow saw into blocks and used to build a shelter. That is me and Thomas Nylen working in the hole. The system is powered by those batteries that are charged through solar panels. The batteries are charged in the Astral summer and runs for months from those batteries during the months of darkness during the Austral winter. 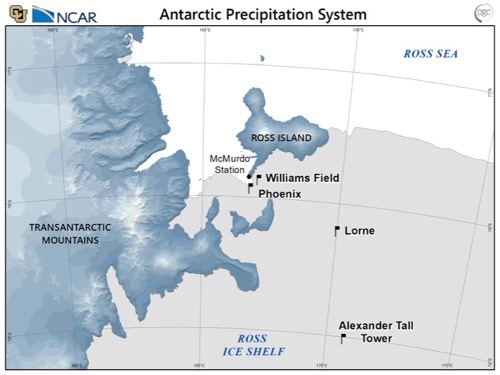 Antarctic Precipitation System map showing locations of APS in the area of the Ross Ice Shelf. 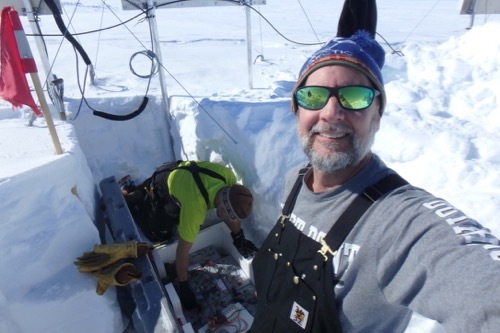 Once we got to the APS system out on the ice, we loaded a sled and dragged all of our tools and gear to the site. We had a full set of standard tools but there were few cool notable items...like the ice drill and two ice axes! 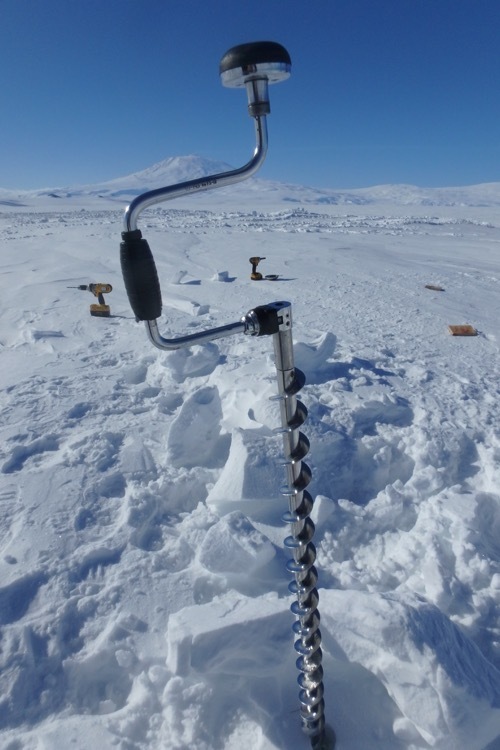 Ice auger used to bore holes into the Antarctic ice. At this site it was used to drill holes for marking poles. Latitude given is 81°30’0” N?? Mike, aren’t you in Antarctica? I’m confused. John, Thank you, you are correct! Good catch! I left off a "-" sign! And THAT put me on the other side of the Earth! I'll explain what I KNOW you already know, but for those who don't already understand the Graphic Coordinate System...When I put the Longitude and Latitude in this portal, I have to use DD (Decimal Degrees) where both South and West are shown as negative numbers. When I put them in, the program translates them into DMS (Degrees, Minutes, Seconds) where it will show as N, S, E, or W. Since I left off the "-" for -81.30 (in the southern hemisphere). The omission of the "-" sign put my position somewhere in the Arctic Ocean, very near the North Pole! I fixed it! What was the tempeture in the picture where you and the man had no gloves or heavy coats. Trent, It was relatively cold...about 15 ˚F. BUT, it was really sunny and there wasn't much wind. Since we were working hard digging that hole we were getting pretty warm. It is really important to avoid getting sweaty, so it is a constant process of putting on and taking off coats, hats, mittens, and gloves trying to say dry and comfortable. Being wet from sweat can be a very bad thing when it is really cold. Why can't you have a electric drill? Burke, We do have two electric drills that we used at that site, but they were used for drilling small holes in metal. The big ice auger is a hand tool. I guess that it COULD be electric, but it isn't too hard to use it to drill into the ice. No biggie. Anna, Good question! Those poles are used to warn people about what is there. Black flags mean "Danger" and usually point out crevasses. Red and Green flags mark things that you need to be aware of. Red flags also mark the roads around here. Blue flags mark fuel lines on or under the snow. I'm not sure about the BEST insulation. I know that the "Big Red" coat they issued us is made of goose down and it is really warm...almost too warm sometimes. Hey I'm in Kevin's biology class in Utah. From what I've heard it gets pretty cold in Antarctica obviously. What is the warmest its ever been? In the pictures you have your coat off, that kind of seems like the weather might not be as bad as I've been told. Is it as bad as every thinks it is? Isaac, There is a good reason that there is so much activity here in the Austral Summer. It is much better weather, but this weather is not the norm. We are right near the coast and it is much more harsh and cold once we get deeper onto the continent. That said, it can, and probably will get much worse than this...it is just a matter of time. I looked up the extremes for the month of December (remember that December here is like July back home - as "Summery" as it gets). It has been as warm as 55˚F (Amazingly warm) and as cold as 1˚F with winds up to 77mph and windchills in the -50˚F. SO, while it is nice right now, it isn't always. BTW at South Pole right now, it is -28˚F with a windchill of -58˚F...I'm not looking forward to dealing with that kind of cold. Hey Mr. Penn, my name is Jaxon, I'm in Kenvin's Biology class, and I was wondering what the hardest part of the day is for you down there? Jaxon, Hmmm....the hardest part... that's pretty subjective. I'm going to say it is the late evening. At that time, it is still broad daylight, but it is time to go to bed. But it is also the time when the stunningly slow internet works slightly better than during the day. It is that time of say when I can upload videos to Youtube for these journals and the time when I have an opportunity to respond to questions like yours. It is hard because it is time to get some rest, but also the time when I can actually get some of my PolarTREC responsibilities that I couldn't do during the day. How long have you been on this journey and where have you been? Cecelia, I left the day after Thanksgiving and today is December 1. I will be here until around the 21st of December but might get caught in some weather and have to spend more time. I've been told (many times) to expect delays. I flew from home (in Pittsburgh) to Houston and from Houston to Auckland, New Zealand. From Auckland, we flew to Christchurch, NZ and from there we flew here (Three days ago). We'll fly from here to the South Pole in a few days. From here we went out to the Ross Ice Sheet and will have a lot of trips out from both here and South Pole. Natalia, We are on New Zealand time here in McMurdo. New Zealand is GMT +13, and you in Utah are GMT - 7, so it is tomorrow -4 hours. So, I sleep during the "night" from about midnight to 6 in the morning. The thing is that it is daylight all 24 hours of every day, so there really isn't a difference between day or night. The only difference is what direction the sun is in the sky. Tanner, Batteries? I'm not sure what type of batteries you are asking about. If you could be more specific maybe I could answer your question. Why is it called The Ross Ice Shelf? Also why don't you have your huge coat on? Abigail, is named after a guy British guy named Captain Sir James Clark Ross, who discovered it in1841. Before that, it was called The Great Ice Barrier since it prevented sailing further south. The Ross Ice Shelf is the largest ice shelf of Antarctica. It is about 500 miles across. Actually, it is just about the size of France). It is several hundred yards thick. Ninety percent of the floating ice, as it is with icebergs, is below the water surface. The reason that I'm not wearing my coat in those pictures is it was really sunny and there wasn't much wind. Since we were working hard digging that hole we were getting pretty warm. It is really important to avoid getting sweaty, so it is a constant process of putting on and taking off coats, hats, mittens, and gloves trying to say dry and comfortable. Being wet from sweat can be a very bad thing when it is really cold. Have you seen any penguins yet? Abigail, I have not seen any penguins yet but I have seen dozens of seals (I'm going to post a journal about that this evening). I will get to see penguins if we can get out to a place called Cape Bird - there is a big penguin rookery there. I can't wait!